Listed here are festivals and events around the state of Louisiana in chronological order. It is updated regularly so you'll want to bookmark it and come back frequently. 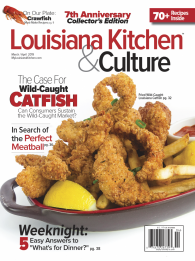 Louisiana Kitchen & Culture magazine provide this listing service as a courtesy to our visitors as well as our friends at tourist orgs and CVB, cities and towns, universities, cultural and charitable groups. We try to focus on community and family based events, festivals, food etc. If you find this useful then please consider supporting our efforts with your subscription to the magazine, Thank you. We are updating the events and festivals schedule, contact jim to add yours or make correction to current listing. If you don't see your group's event listed you can use the contact form in navigation bar across top of page to let us know.